Discover the benefits of granite countertops. When you enter any home or apartment or check any lifestyle Instagram, it’s likely that you’ll notice a huge trend in the kitchen: granite countertops. This welcoming material may be popular, but there is definitely a reason. 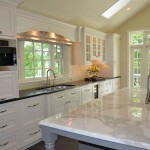 Granite countertops are one of the most durable, functional, and beautiful materials on the market. At Rock Top Fabrications we can help you meet your perfect counter match regardless of material, but today we want to walk you through some of the most significant benefits to this fantastic countertop. There are very few materials as able to take the abuse that granite can take. In fact, you’ll have to try hard to hurt it. Placing a hot pan directly on granite, spilling liquids all over it, or the claws of a pet will not have any effect on your counters. This means it is perfect for the homes of active families, and clumsy chefs alike. In the case that you do manage to chip or scratch your grant, say you need to kill a spider with a cast iron pan, granite is easy to fix. Your installer will bring a color-matched putty to patch the chip or scratch, and then reseal the counter top to ensure that the stone is protected once more. Thanks to the nature of granite and the sealant on top, your countertops will not be able to absorb any bacteria or hold onto the dirt. To clean your countertops you’ll only need to give a quick rinse and scrub, and you won’t have to worry about unwanted bacteria or germs. With the superior durability and beauty of natural granite, it has a considerable value adding impact to your overall home and kitchen. In fact, having granite countertops is often a selling point for many homes and apartments. While it may not add to the monetary value, it will undoubtedly help with attracting potential buyers and renters. This entry was posted on Friday, September 21st, 2018 at 11:27 am. Both comments and pings are currently closed.